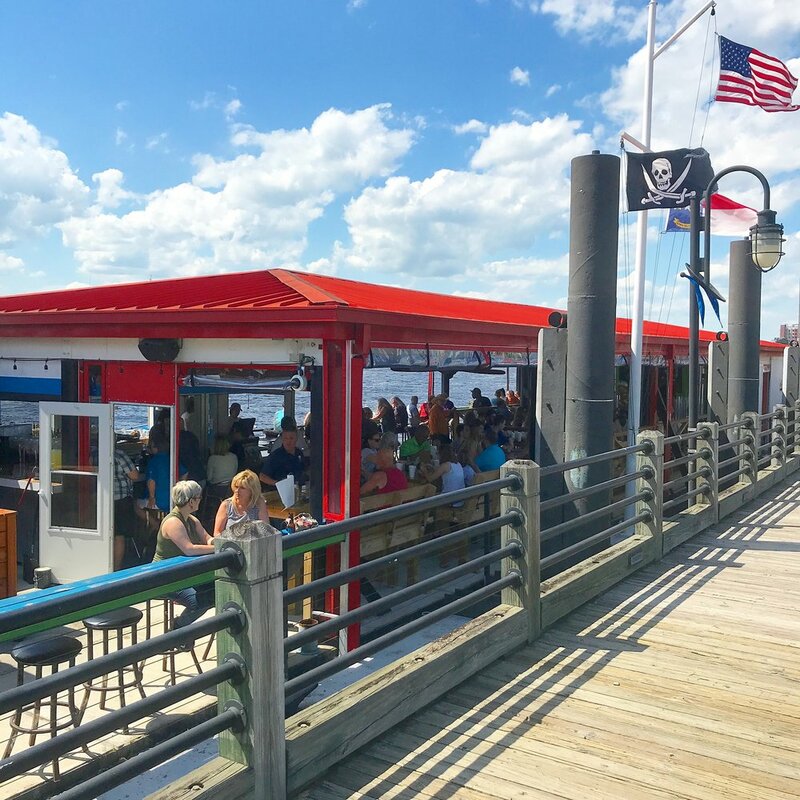 Floating on a barge along the Riverwalk in downtown Wilmington, Anne Bonny's Bar & Grill specializes in calabash-style seafood, shareable appetizers, and classic burgers and sandwiches. Our full bar features frozen cocktails, local draft beer, and excellent wines. Our pet-friendly bar and restaurant is open for lunch and dinner and provides a casual, open-air waterfront atmosphere like no other along the Cape Fear. Locals and tourists alike can enjoy live music, spectacular sunsets, delicious seafood, and outstanding cocktails all in the heart of downtown Wilmington. Anne Bonny's Bar and Grill has become downtown Wilmington's favorite outdoor bar and restaurant since opening in May 2017. Stop by and you'll find out why! We are located on the water in downtown Wilmington across the Cape Fear River from the Battleship USS North Carolina, steps away from local breweries, outstanding shopping, and the famous Wilmington Riverwalk. Some nights we may close a little early due to poor weather. Buffalo, Garlic Buffalo, Garlic Herb, Barbeque, or Asian Chili. Available in orders of 6 or 12. All baskets are served with choice of 2 sides: crinkle fries, fresh corn, coleslaw, potato chips, fruit, tots, or a side salad. Marinated, all-natural grilled chicken on brioche with lettuce, tomato, onion - try it blackened! Choice of either grilled chicken or steak, with grilled onions and red peppers, topped with melty cheese - try the chicken buffalo style! Smooth and crisp German-style beer, slightly malty with a bit of citrus, delightfully refreshing. Rotating pale ales from one of our favorite local brewers! For reservations of 8 or more, large parties, questions or comments, please fill out the following form. You will not be contacted with any marketing materials or be added to any lists by filling this out. We want to hear from you! We’d love for you to visit the only floating bar and restaurant in downtown Wilmington!